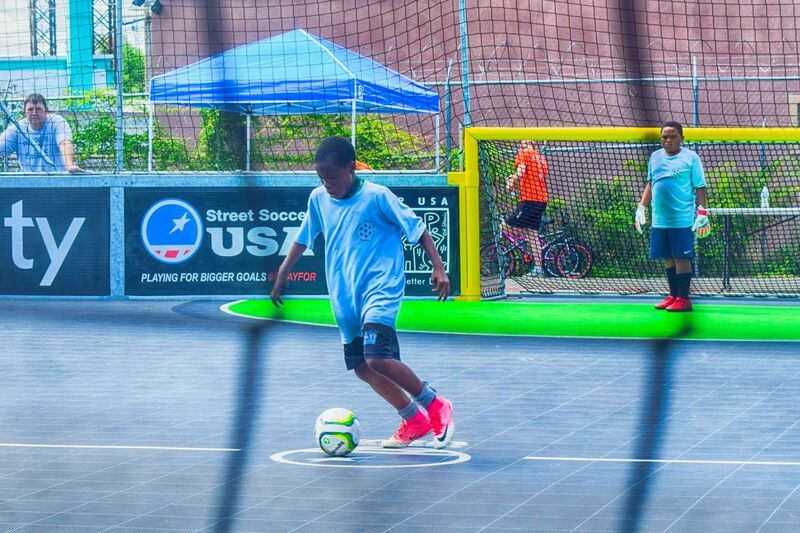 Street Soccer USA held a tournament at its court-style mini-pitch in Kensington on Aug. 4. When Kyle Martino lost his bid for U.S. Soccer president in February, he did not lose his energy to grow the sport's foundations here. He simply needed a new outlet for it. During his campaign, Martino met Lawrence Cann, CEO of Street Soccer USA, an organization that runs soccer tournaments for underprivileged kids and adults in cities nationwide. The organization also builds small, hard-court soccer venues in areas where the game is often inaccessible. One such venue went up two years ago in Kensington, on Jasper Street near Castor Avenue. It hosted an event this weekend. "Lawrence was one of the people I went to early in the campaign to say teach me, tell me about what's out there," said Martino, who on Friday returned to his day job as an analyst on NBC Sports' English Premier League broadcasts. "I was really blown away." It didn't take long for their shared passion for soccer to turn into something bigger: Cann asked Martino to chair Street Soccer USA's board. "I related to him on that level, and I think a lot of people do on TV for sure," Cann said. "We've got a constituency of folks that are charged up." Martino said it took "all of 30 seconds" to say yes. "Street Soccer USA for me just fully encapsulated where I thought most of the attention needed to be — and [where] the biggest change can happen," he said. "That's at the bottom of the pyramid, the grassroots. Trying to grow the game in communities that not only need it most in terms of what soccer can do for your life, and what the social vehicle can be, but also to continue to build a strong soccer foundation in this country that everything can stand on top of." It sounds high-minded, but it's personal. Martino knew even as a youth prospect that there was a side of the game he needed to see more of. "I'm a kid from the suburbs, and I'm a rich white kid who came through that version of the game, but I constantly was able to seek out and find where it lived and breathed in other versions," he said. "I feel guilty sometimes that I've been so fortunate to come through the system simply because of the serendipity of my socioeconomic status. … I'm for sure going to take the gifts that I was given and make sure that golden ticket isn't necessary for someone else to feel the gift of the game the way I did." He has been working with the U.S. Soccer Foundation, whose signature project aims to build more than 1,200 mini-pitches nationwide. The Foundation and Street Soccer USA have had a long relationship, and it continues growing. The Foundation has recently made big pushes in New York, Chicago and Atlanta. It hasn't come to Philadelphia yet, but it will. U.S. Soccer Foundation president and CEO Ed Foster-Simeon has met with potential funders of projects here, and the city's Parks and Recreation Department. "We'd love to do 50 [mini-pitches] in the city of Philadelphia, but we have to raise the funds to do it," Foster-Simeon said. He spoke of soccer's roots here in the ethnic leagues of Kensington and other neighborhoods decades ago, the ones that produced Walter Bahr and other legends. Back then, soccer in America was a city game. Now it is largely a suburban game, with less wealthy players — many of whom aren't white — shut out of development pathways. Everyone in the sport knows that must change. "Children grow up playing basketball because basketball courts are readily accessible in their neighborhoods — they don't play soccer because nobody has introduced the game to them," Foster-Simeon said. "To see the opportunity, the fun, the potential, the athleticism of playing soccer, I think it opens up a whole new door for the game." Martino knows he has a bully pulpit. He has already brought more big names onto Street Soccer USA's board, including Steve Nash and Tim Howard. "In the suburban, rich, country-club version of this game, where fields are pristine and jerseys don't have stains on them and the cost of play is enormous, it doesn't feel like it belongs to people in the city," Martino said. "It's a systemic issue, and it's only getting worse until we have the humility to admit where we're wrong, and the courage to go and attack it." Players in action at Street Soccer USA’s recent tournament in Kensington. The awarding of the 2026 men's World Cup to North America created a clear target for which to aim. Add in the 2028 Olympics in Los Angeles and a potential bid to host the 2027 women's World Cup here, and there's a decade-long runway for soccer in this country. Players who could represent the U.S. in those tournaments are in cities right now, just waiting to be found. "The numbers of cities that we have that have huge inner-city populations, [they] have not been as connected to the game as we'd like to see," Major League Soccer commissioner Don Garber said. "There is a movement to try to get down into the inner city with our sport, and hopefully we'll be able to see the benefits of that in MLS [and] through our national teams." Garber said he was "totally enthralled" by the diversity of France's World Cup-winning national team. Star players such as Kylian Mbappé and Paul Pogba rose from impoverished areas of the Paris region to global stardom. That can surely happen in the U.S. if there's enough willpower and focus. Martino is here for it. "It doesn't matter whose name gets slapped in the middle for us [at Street Soccer USA], and I know it doesn't for Ed," he said. "If there is a field that can be built, if there is a program that can be funded to give kids access to this game, just tell me where to show up." Can Ernst Tanner bring the next Roberto Firmino to the Union? He found the Liverpool star.